GRAND RAPIDS, Mich. – Teresa Fiocchi of Augusta, Mich. was today crowned the grand prize winner of the Our Family® is Souper recipe contest, winning $2,500 in free groceries for her Fiocchi Family Pasta e Fagioli soup. Fiocchi’s Pasta e Fagioli soup was selected by a panel of judges – including SpartanNash Executive Vice President, Merchandising and Marketing Larry Pierce, Grand Rapids Community College’s Secchia Institute for Culinary Education Professor Charles Olawsky, Grand Finale Executive Pastry Chef Justin Raha, Executive Chef Glenn Forgie and WZZM Meteorologist Laura Hartman – at a final tasting event, held today at the Metro Family Fare Supermarket in Wyoming. The Food Bank of South Central Michigan, who was paired with Fiocchi during the Our Family is Souper contest, will also receive $2,500 in Our Family products, reinforcing SpartanNash’s commitment to building local relationships and fighting hunger in the communities it serves through its family of retail stores, distribution and service centers and independent customers. As the grand prize winner, Fiocchi’s Pasta e Fagioli recipe will be featured on spartannash.com, ourfamilyfoods.com and Family Fare Supermarkets, D&W Fresh Market, Forest Hills Foods, ValuLand and VG’s websites. The award-winning recipe and ingredients will also be available through Fast Lane, SpartanNash’s seamless online grocery shopping experience. The Our Family is Souper recipe contest is part of SpartanNash’s introduction of its Our Family® brand in the Michigan market. Hundreds of home cooks from across the state sent in their favorite soup recipes in January, with 10 semifinalists advancing to an online voting period. The top five finalists selected by popular vote advanced to the judged tasting of their soup recipes, with Fiocchi named the grand prize winner. 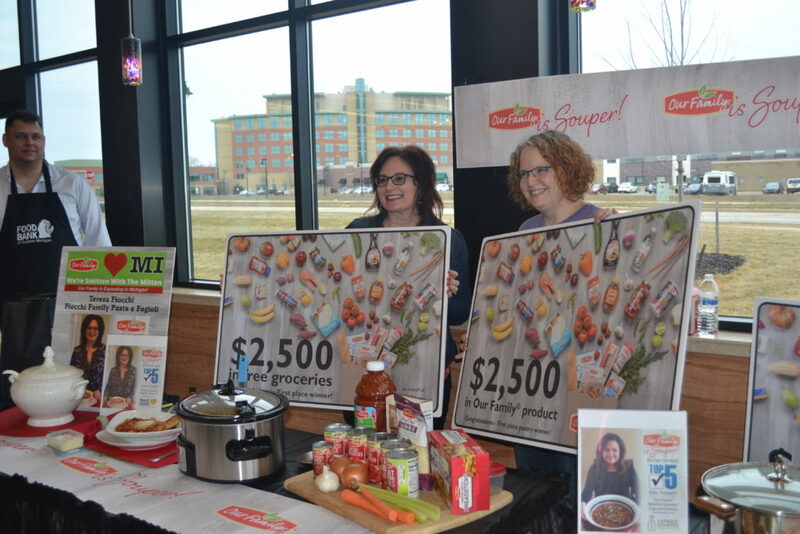 Rita Tomaro of Grand Rapids was named the runner up for her “Delicioso” Mediterranean Sup-perb soup and will receive $1,500 in free groceries, with God’s Kitchen receiving $1,500 in Our Family products as her pantry partner. Prizes ranging from $1,000 to $250 were also awarded to each of the remaining finalists and their pantry partners, based on the judges’ scoring of each recipe. First place: Teresa Fiocchi of Augusta, for her Fiocchi Family Pasta e Fagioli. Teresa is paired with the Food Bank of South Central Michigan. Second place: Rita Tomaro of Grand Rapids, for her “Delicioso” Mediterranean Sup-perb Soup. Rita is paired with God’s Kitchen. Third place: Amy Zeilenga of Door, for her Bacon Corn Chowder. Amy is paired with Buist Community Assistance Center. Fourth place: Kaye Zbiciak of Hastings, for her Powerhouse Chicken Vegetable Soup. Kaye is paired with the Hastings Area Food Pantry. Fifth place: Frederick Brushaber of Grand Blanc, for his Kickin’ Cheeseburger Soup. Frederick is paired with the Food Bank of Eastern Michigan. Each recipe is also available on the Our Family blog to print and make at home. As many as 1,700 Our Family products are being introduced at SpartanNash’s 87 corporate-owned retail stores and more than 300 independent retail customers throughout Michigan, offering quality and value in every aisle. The Our Family brand has offered “Quality since 1904,” including a best-in-class, risk-free Satisfaction Plus Guarantee; Facts Up Front nutritional labeling; category specific packaging; and a community support program, Direct Your Labels™.